Founded in 1940, the Michigan Retailers Association (MRA) represents more than 5,000 businesses and their 15,000 stores and websites. 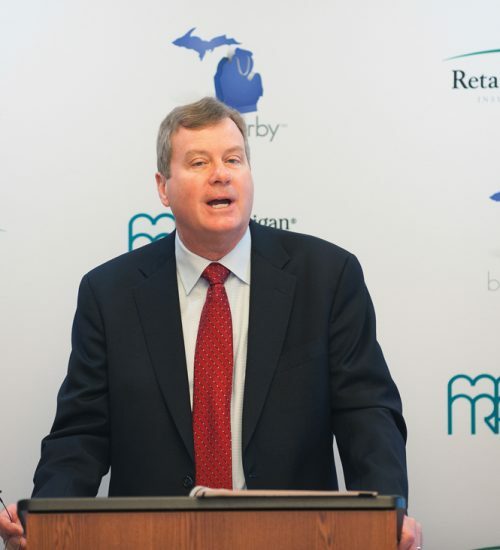 As the voice of Michigan’s retail industry, the association works to promote retail-friendly policies, protect the retail industry from harmful taxes and regulations and education consumers on the importance of keeping their money in the Mitten. The insight that “The Only Constant Is Change” has become a staple of our annual boardroom review of the year just ended. Author Isaac Asimov’s quote appears in each year-end PowerPoint because it captures so cleverly the essence of our dynamic, technology-driven world. At the Michigan Retailers Association, we work hard to make change work for members. As an example, this year retailers across Michigan faced the biggest industry change in decades with the rollout higher-security EMV/chip cards. MRA mobilized staff and suppliers to provide members with the knowledge and updated equipment necessary to meet new requirements. This year marked the 75th anniversary of the Michigan Retailers Association as a trusted resource for thousands of businesses, retail and non-retail alike. We look forward to serving our members—helping them grow, learn and adapt to change—for years to come.